The big locos on the ECML could accelerate like stink! Thanks for the info on the LN. Thanks Tony and others for comments. I rather shot myself in part of a foot as I was thinking this was possibly 'limit ahead' sign from a possible higher speed stretch, thus showing my ignorance of the shape of such items and also thinking that the speed of trains over the crossing could have been higher than 65mph and needed to reduce to 80 maximum. Presumably there were limit signs on approach to the crossing? All this, of course, would have been part of crew knowledge for the route. Could you just share that 'info' Peter? Just seen this and it would save me some searching if you would not mind and enable me to seek some out at York. At the moment I am using plastic tube for some op's and I can see it isn't always going to be suitable for certain tasks. Link below, I am only using the piano wire and PTFE tubing . I agree 100%. One of the nicest things that has happened to me in the hobby was when somebody mentioned how good they thought I was at engaging with people at shows. I usually come away from one with some new knowledge. It is just as easy to start a conversation without it involving picking fault. Exactly and that has happened to me at the one show where I exhibited a layout of mine*. Fortunately it was at Retford quite a few years ago and the footfall was (and always is) 'limited' and so I was not exhausted by having to engage for hours over the two days. It was exhausting enough physically, but I did enjoy the company of my older son who was out front at one control point most of the time. I also rather enjoyed the interaction between us and the 'civilians'. I was also lucky in that most visitors (civilians) were 'locals' and as my layout was EM and should probably have been more carefully presented, however time had not been kind. There were one or two rather bodged items (a footbridge for one and it was adapted Airfix + some Wills' bits) added in a hurry, to distract from a baseboard join, before the show and being not structurally 'correct'. The back-scene(s) were also very crude but not untypical! I did point out to many that it was an example of how a layout, that was more 'to scale' trackwise, could be cobbled together by someone without huge amounts of technical skill and experience. It was a have fun and play trains item but with the look of the real thing. *I turned down offers for that layout to attend smaller shows as it is such a complete struggle to set up and break down and I'm not so fit these days. I also thought it would need large amounts of work if it were to be viewed by, shall we say, a more discerning audience. Regarding the flat crossing at Retford, I've just come across an example of 'a little knowledge is a dangerous thing'. I've just reviewed (among others) Book Law's latest Last days of Steam on the Eastern Region. It's beautifully reproduced, and has some fantastic pictures in it, including some stunners at Retford. However, the compiler, seeing a '10 mph'' restriction sign in one of the images, assumes that's for the crossing on the main line. Of course, it isn't; it's for the curve from the GN (platform 1) to the GC towards Thrumpton. Thus, comments such as an A1 slowing to observe the 10 mph restriction over the crossing are nonsense. The regulator's in the roof and it's having a go in preparation for climbing Gamston! Wizard Models also sell wire and tube, that is where I got mine from. Can I ask a question to the BR(E) great and good on this thread? I am finishing off a D.331 Thompson BTK(3) (Comet sides on Bachmann donor), and I’m stuck with the lining. I can’t determine whether the upper lining should be continued above the brake compartment and if not, where it should stop. I have found photos which seem to show lining there, but others on which it is not evident, and I note that Bachmann did not line above the brake compartment on their old maroon Thompsons. Was there a date on which policy changed from not lining to lining, or am I just seeing things in the photos? As you can see below, I have continued the lining, but I’m now having doubts! PS. Photo is work in progress. Roof, glazing and stepboards still to be addressed. I would do, (and have done), as you have done. I wonder if I may ask you a question please? I know somewhere back in your thread you refer to using transfer numbers that can be applied to a locomotive smokebox number plate, and I believe you said you can purchase the entire set of numbers for a whole class of locomotives on just one sheet. I know you spoke highly on the quality of the product, If you can remember the company that supplies these transfer sheets I wonder if you would please be kind enough to let me know their name. It would seem that some were lined below the cornice, but many weren't. I've always lined mine. Looks like I needn't have bothered! Was this a Works thing do you think? York doing it one way and Donny (or wherever) doing it another? I know Stratford were a bit of a law unto themselves. I assumed that they were all lined, but, clearly, from the pictures, many (most?) were not. You have got me intrigued now. I shall ask a friend to see if there are any clues at the NRM. I think that the OP was asking, when there IS lining at the cornice, should it continue above the brake section. IMHO, the answer is 'Yes' - whether many of these coaches had cornice lining is immaterial to the OP. It might be immaterial to the original question, but it's certainly of interest to me (as, I hope, it's of interest to others). I merely expanded on that 'question', giving myself answers that I hadn't understood before. For what it's worth, when I next build/paint/line a Thompson brake in BR maroon, I'll omit the top lining altogether. It's certainly quicker and, it would seem, that's the most common. Andy is free to entirely disregard my earlier post, as is everyone else. It might be immaterial to the original question, but it's certainly of interest to me (as, I hope, it's of interest to others). Indeed - it just seemed to me that we were in danger of not answering the OP's question by going off at a tangent. Thanks again, and you're quite right. As an ex-teacher I'm used to dodging questions! snap, I have a 'mini me' Thompson BT 5 going through the paint shop at present. I will give the varnish another twenty four hours, add a little weathering, glaze, paint the cornise and ends, finish with the roof and it will be ready to trundle. Your carriage would be much better suited for pole vaulters I feel. Seeing the boss is out for a few hours I will jump in. The company is Pacific Models. They are not transfers put printed sets of numbers. You just cut the one required from the sheet with a very sharp scalpel and attach it to the smoke box front. They are indeed an excellent idea and provide a very neat finish. Funnily enough I ordered some at the weekend. As Bernard has said, the company which makes the front numberplates is Pacific Models. It's actually Ian Wilson, who started Prototype Models. As Bernard has also said, these are not transfers, but printed paper. As such, they need to be cut out with care, and exposed white edges taken out with a felt tip pen (checking that it doesn't bleed). The 'plates are then stuck in place with PVA. After a loco is painted, I stick them to a backing piece of brass, already soldered to the smokebox door. Every loco in a class is represented, in some cases with 'incorrect' '6s' and '9s' as well as the true Gill Sans types. I use them just about exclusively. I've also fitted them for friends; in this case one of Gilbert Barnatt's A2/2s, this one built by John Houlden. There is just one word of caution. Weathering can damage the 'plates, so I fit them after that's completed. Even on dirty locos, the numbers were often repainted. Ian also does a full range of carriage destination boards, like the numberplates in both 4mm and 7mm scales. I think the answer might be answered in part by Tony’s second picture which seems to show lining going all the way along the top . Many thanks to all for the comprehensive responses, especially all those photos from Tony - much appreciated. It does look like they were either lined all the way across or not at all, but I suspect that Bachmann would have had a prototype for their decision to line above the compartments, but not the brake, so maybe all three approaches existed. I think that, like Tony, I may leave off the top lining next time and save myself some time. That coach looks superb. Is it for LSGC? If so I look forward to seeing it in action. I may be dim, but I don’t get the pole vaulter reference! In the world of model warships, there are huge arguments as to what colour the USS Arizona was when the Japanese attacked Pearl Harbor. Even those who were there on the day could never seem to agree. ... and don't get me going on "Mountbatten Pink". Apparently the vessels so painted were practically invisible even close to, in certain lighting conditions. But the ships' crews all died ... of embarrassment. many thanks for the comments, your dia 331 looks very neat. One of my all time favourite Thompson carriage formations, was the Norseman. If I remember correctly, it was toped and tailed by dia 331, a very pretty train. Did you not no that the van compartment were designed to accommodate an Olympic pole vaulting team? 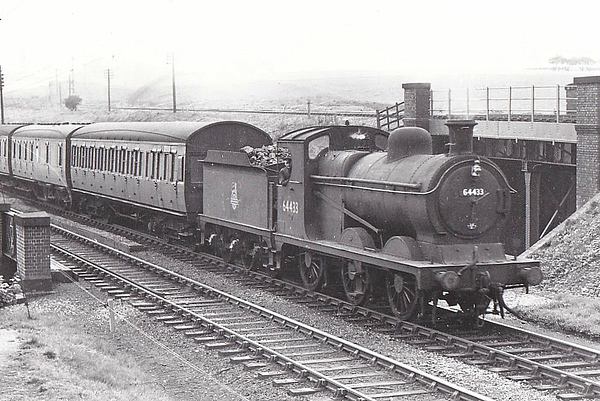 Yes, the BT 5 is for LSGC, they were allocated new in 1950 to the local three sets. They joined the Thompson CL's and ran with the ex GC 60' seven compartment BT's. An Olympic pole-vaulting team? The brake section of a Thompson carriage designed around the requirements of that? Where did that information come from? I know it's April, but it's not the 1st! Assuming it's true.................. Yes, the carriages would have been in existence in 1948 (the year the first post-War Olympic games were staged in London), but, unless the English pole-vaulting Olympic team was based in the North, then those carriages would never have been used for the purpose they were designed for. Any foreign athletes would have come to London from the South, unless they were Scandinavians. Perhaps the LNER coach-builders had fantastic foresight, expecting their products to still be running in 2012! If true, I've learned something new today!